UPDATED: Tue., April 3, 2018, 8:48 p.m.
Derek Tran’s rise to the top was astonishingly fast. The Rogers High School senior starting cooking only last year. 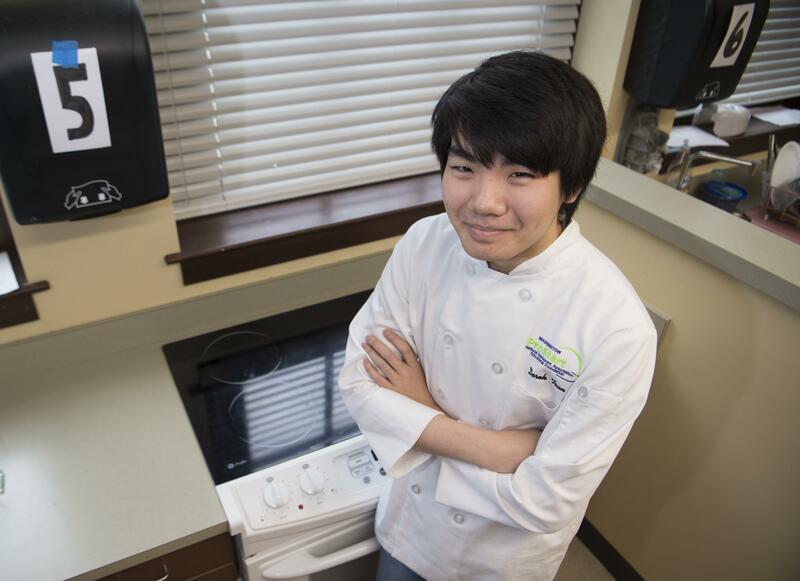 Earlier this month, he was named the top culinary student in Washington as the winner of the Student of Excellence Award. The prize, which includes a $1,000 scholarship, was announced at the annual ProStart Invitational culinary competition held this year in Spokane. He was on the Rogers High School culinary team at the competition at the Hotel RL. The group had an hour to make an appetizer, main dish and dessert using nothing but a butane burner – no electricity or running water allowed. The team made a ceviche appetizer (a seafood citrus dish with roots in South America), lamb with pickled vegetables and dark chocolate mousse. During the preparation, they had to use a hand-cranked blender, which they practiced with for months, Tran said. The competition for Washington state students was hosted by the Washington Hospitality Association. The ProStart hospitality program is offered at high schools across the country. Tony Reed, director of food service at Spiceology, spoke of Tran’s 4.017 GPA and hard work in a letter recommending him for the award. He also wrote about his participation in the Prep Cook Apprenticeship program at the Davenport Hotel, and his quick mastery of a complicated knife cut called the tourné that turns root vegetables into oblong, seven-sided shapes. Tran has always been quiet and shy, but Grow said she has seen him come out of his shell in the past year. “He’s just grown so much,” she said. He joined the class because he was looking for an elective to go with his schedule of AP classes. “I would always watch my mom cooking, and I was interested,” he said. Tran grew up in Spokane, but his parents emigrated from Vietnam in the 1990s. His mother cooks mostly traditional Vietnamese food, but Tran said he doesn’t really get in the kitchen at home. He said his mother likes things done quickly and in a certain way. Tran said he doesn’t have a favorite dish to make, but he does like to make pasta noodles from scratch. He has been accepted to both Washington State University and the University of Washington, but hasn’t decided which school he will attend or what he will study. “I think hospitality might be an option,” he said. Despite earning the Student of Excellence Award, Tran said he’s not sure if he will participate in future cooking competitions. “It’s kind of stressful,” he said. Published: April 3, 2018, 8:15 p.m. Updated: April 3, 2018, 8:48 p.m.